Young & Franklin’s industrial gas turbines require precise control of the combustion process to drive efficiency, reduce emissions, and maximise availability. When combined with the YF 1100 Series Digital Motor Controller, the company’s EMA valves provide this control and offer substantial advantages over their hydraulically actuated counterparts. The Young & Franklin 8655 Series Electric Stop/Ratio Valves are designed to regulate fuel pressure and provide rapid fuel shutoff capability. Fail Safe to closed position is accomplished by the use of two torsion springs. The actuator is suitable for fuel modules in Class 1 Div 2 Hazardous Locations. The Young & Franklin 3010 Series EMA Choked Flow Gas Control Valves (GCVs) provide excellent speed and valve position accuracy. This GCV electronically homes on power cycle and has a turndown ratio of ~100:1. The entire YF 3010 Series is certified for use in hazardous locations around the world and available in a range of sizes suitable for industrial or power turbines of any size. The 3010 Series valve body is coupled to an actuator assembly that contains a fail-safe spring to quickly close the valve, halting fuel flow in the event of a power failure or turbine trip condition. Shock absorbers protect the actuator drive mechanism and valve seats during rapid closing, ensuring reliable operation and independent position feedback can be obtained via 2 optional LVDTs. The complete system provides precise fuel flow delivery with reliable operation. No routine maintenance is required. The Young & Franklin 3010E620 Valve is EMA and provides unchoked flow for use on aeroderivative turbines. This fuel metering unit is certified for use in hazardous locations around the world. 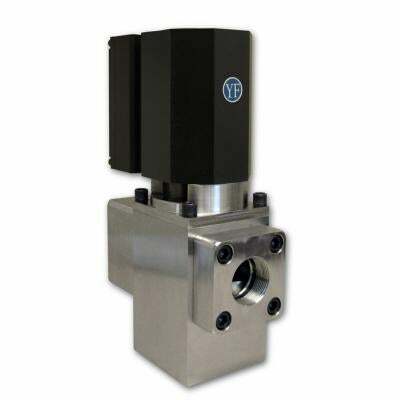 The Young & Franklin 8641 Series Integrated Gas Control Valve Assembly is a balanced double-poppet flow control valve. This stainless steel bodied valve features a Fail-in-Place, NACE IV compliant design. With a known Cv curve, the 8641 can be operated via closed-loop positioning by any modern turbine controller. When coupled to the YF 1100D300 series digital motor controller, the 8641 is a retrofit replacement for the hydraulic actuator, butterfly and loader valves commonly found on Solar Centaur, Saturn, Taurus and Mars gas turbines. The 8641 regulates flows directly based on compressor discharge pressure and set-point signals. The Young & Franklin 1100D300 Series Digital Motor Controller (DMC) accepts a position or triple redundant velocity commands to run YF’s full suite of EMA products. With a peak rating of 3.5kW, the 1100D300 DMC provides ample power while being precise enough to ensure accurate positioning. The dynamic response of the 1100D300 DMC can be uniquely tailored to fit customer needs, allowing for a drop in replacement of existing systems. The 1100D300 is certified to EN61800, guaranteeing excellent noise immunity, and incorporates a flexible control scheme including enable, reset and trip functions. No user programming is required due to factory software configuration.